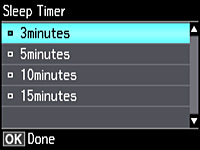 You can use the product's control panel to change the time period before the printer turns off automatically. 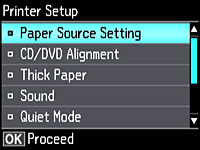 Press the arrow buttons to select Settings and press the OK button. Select the length of time after which you want the product to automatically turn off when it is not in use and press the OK button. 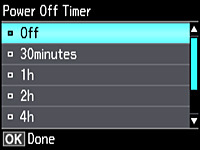 You can use the product's control panel to change the time period before the product enters sleep mode. Select the time period you want before the product goes to sleep and press the OK button.